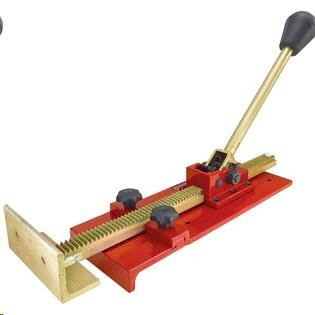 The PortaJACK-PRO floor tightening jack is designed to hold flooring strips tight and keep in place for nailing. Can also straighten crooked or bowed flooring strips and hold in the nailing position. It can apply more than a ton of force and provide the hold necessary to free the installer's hands for nailing. The PortaJACK-PRO is designed as one tool that will both push or pull the flooring strips tight. With its removable shoe you can efficiently position the jack on the floor or in the field of flooring without damage to the flooring, enabling hands-free operation for nailing. * Please call us with any questions about our floor tightening jack in Mason OH, Westchester OH and Cincinnati metro area.